Please note that the Micr-O Controls are recorded on the RouteGadget map as just little circles - blue for Blue, green for Green, and the correct control circles are thicker than the incorrect ones. They are NOT identified to RouteGadget as being controls. When you enter your course, please plot your route to those Micr-O Controls that you visited - but you will notice that RouteGadget will not "snap on" to these controls, because it doesn't know that controls is what they are. You will see that while you are entering your route through the Micr-O controls, the "next control" in RouteGadget is the Finish. That's fine. Just view it as you normally do, probably with Mass Start on. 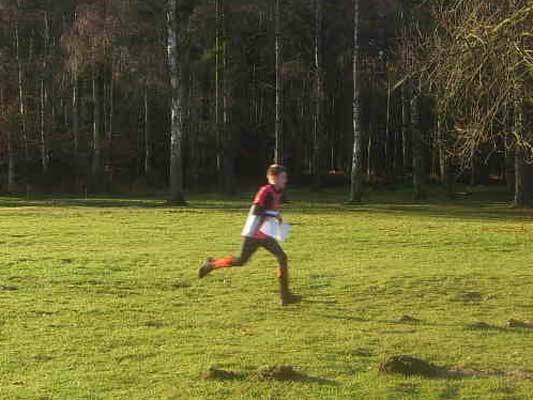 You will notice that competitors who haven't entered their routes go straight to the Finish. All the controls, including the Nan-O controls in the labyrinth, are identified to RouteGadget as being controls. The only controls that are NOT identified to RouteGadget as controls, and are just shown as red circles on the map, are the "Arrival" controls on Maps B and C. When you enter your course, please plot your route direct in one leg from the "Departure" controls on Maps A and B to the "Arrival" controls on Maps B and C respectively, and then in the normal way on to the first real control within the "Arrival" map. You will notice that RouteGadget will not "snap on" to the "Arrival" controls, because it doesn't know that controls is what they are. 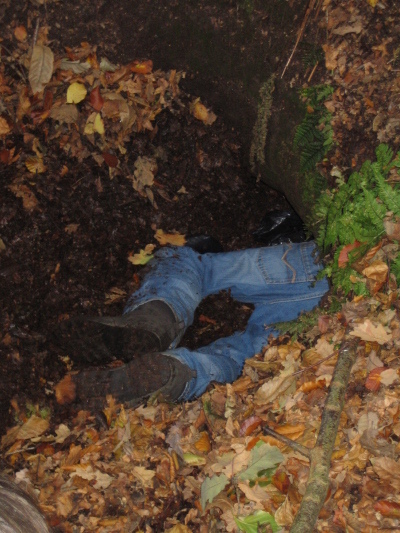 Please take great care when plotting your route through the labyrinth, especially about doing the controls in the right order. You may well find this even more challenging on the screen than it was in real life. If you view this with "Mass Start" on, you will see how you did for time against other competitors. If you view this with "Mass Start" off, you will see who caught you up, and who you caught and passed, just as it happened in the race. When the animation moves between maps, you will see a "teleport" effect where the runner moves at high speed from the "Departure" control on one map to the "Arrival" control on the next map and also on to the first real control within the "Arrival" map. This isn't a perfect teleport, but Deeside's combined wizardy team decided to settle for this easier-to-implement "near-teleport" technology. If you want to follow the animation through the labyrinth, slow it right down to minimum speed BEFORE you teleport to Map B by repeatedly pressing the "Speed -" button. You can tell you've pressed it too many times when the animation starts to run backwards. Well done to our small band of juniors who did us proud by finishing 4th at the final. In a close finish with 2nd and 3rd, we finished one place higher than last year. Dave Schorah was our only winner with Olly Williams 2nd on the light green. A bingo control lost Tom 3 places and the team the 3rd place and Mike Vennard's twisted ankle at Cannock last week was also a blow to our hopes for 2nd place behind what was considered a likely OD victory. Well done to our 5 girls who contributed 4 scores to our team's total by finishing in the top 10 in their class. Editor's note: Thanks to Mike Smithard for organising the trip and for the team talk, Pauline for the pasta sauce and the cake, Mike S, Nigel B and Mike V for driving cars and minibuses, and to all the juniors for coming along, running, and being great company all weekend. Feast your eyes on the full results. Do you fancy moving into PR? If so, your ideal job has just materialised - the club needs to appoint a Publicity Officer. It shouldn't require a great deal of time, nor be too onerous. The purpose of the role is to improve our visibility and profile in the Deeside catchment area by keeping the local media informed of our successes and forthcoming events. Once you have established the contacts of the local papers within our region, then it would just entail emailing a short report of the event with any achievements by locals (with a picture, maybe) and a quick reference to the next event. Please contact any of the committee if you see yourself in this role. Please note that the Bonus Controls for the Club Championships are recorded on the RouteGadget map as just little red circles - they are NOT identified to RouteGadget as being controls. When you enter your course, please plot your route to those Bonus Controls that you visited - but you will notice that RouteGadget will not "snap on" to these controls, because it doesn't know that controls is what they are. Technical note for pointy-heads: RouteGadget can handle score courses as well as line courses; but we're not convinced it can handle the sort of hybrid course that Pete Owens dreamed up for this event. That's why we've done it this way. The Club will be staging a Handicapping Course at Fox Howl on 1 April 2009. Content will include setting and calculating handicaps. Target audience is anyone who may be involved in the above activities. Attendance is mandatory for organisers of the 2009 Club Champs. Top placing for a Deesider was Olly Williams in 6th place in Boys year 9 class. Well done to him. Of local schools, Fallibroome finished 2nd school in both girls and boys year 10 and in the overall category (top 9 places in any class), Ulverston won (yet again!) with 5 north west schools in the top 8. Full results and 1016 photos on BSOA website. On Sunday 2 November on Torver High Common in the Lake District, 17 DEE juniors took on WCOC, BARRO and PFO in a depleted NW heat (some SROC and MDOC juniors went to the November Classic) and ended up one point behind WCOC in second place. Under the rules, DEE go through as well so well done to all who went from Cheshire, Sheffield and Leeds to get DEE through to the final on 7th December. DEE won all 4 boys classes, (Tom, Chris O, Olly Willliams and Mike Vennard) with Matthew, Zoe S, Eleanor O and Philip filling the top 8 places and Bea, Kitty Jones and Sean all finishing 6th so equally sharing the honour of 9th place! Nothing like a team effort. Well done! 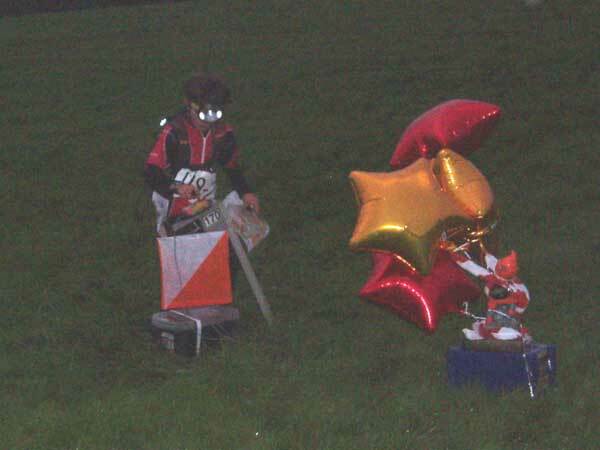 Full results, photos, RouteGadget etc. 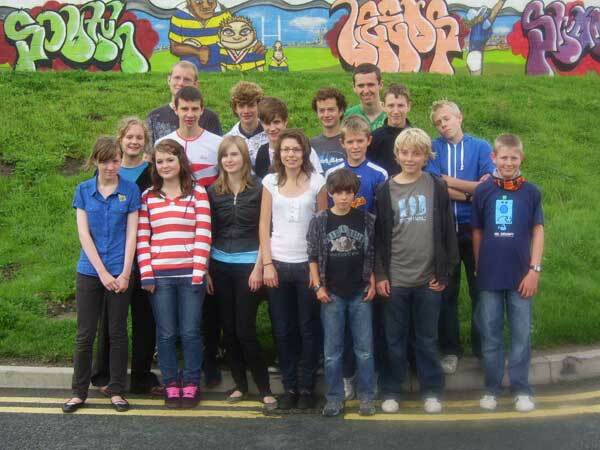 on the SROC website. Pete Owens is one of the winners of the CompassSport crossword, see results published in the current (October 2008) edition. For his cunning and erudition, Pete wins a range of male grooming products, including Hand Repair, Anti-Wrinkle Cream, and an Aftershave Balm which we expect to appear as a prize at the Club Champs. Look out for a particularly well-groomed Pete at future events. Nine runners from DEE turned up to start the 2008 OMM at Seathwaite Farm: Darren Baker and Huw Lewis, Clive Giddis and Jackie Bale in Long Score; Nigel Beasant and Chris Wilcox, Siân Calow and Bob Elmes in Medium Score; Rachel Findlay-Robinson running with Liz Britton of MDOC in Short Score. Several others had entered - Iain Bell, David Scorah and Rhys Findlay-Robinson - but circumstances conspired to spare them the pleasure of running. Nigel and Chris set out just as the rain was setting in, and creditably managed 3 controls, 90 points, before being told that the event was cancelled. They headed back to the car park at the event centre, wading through thigh-deep water on the flooded approach road to Seathwaite, to join Siân and Bob. Siân and Bob started just after Nigel and Chris, and managed precisely one control and 20 points before taking the mature decision to retreat to the car. This must set some sort of a record at £42 per person per control, or £1.05 per person per point. Free tea, soup, and a Wilf's meal put them in good shape for a long day and night in the car. Siân slept across the front seats, while Nigel, Chris and Bob slept sardine-fashion in the back of the estate. Sunday morning saw some epic car-pushing teamwork, which led to our getting out of the car park and onto the (now dry) road by 9am, through flooded Borrowdale and home by midday. Darren and Huw completed Day 1 before being told the event was cancelled, 8 controls and 175 points, 3 minutes within their time limit - pretty good going. At some stage during their run they met John Robinson, who was out there marshalling. 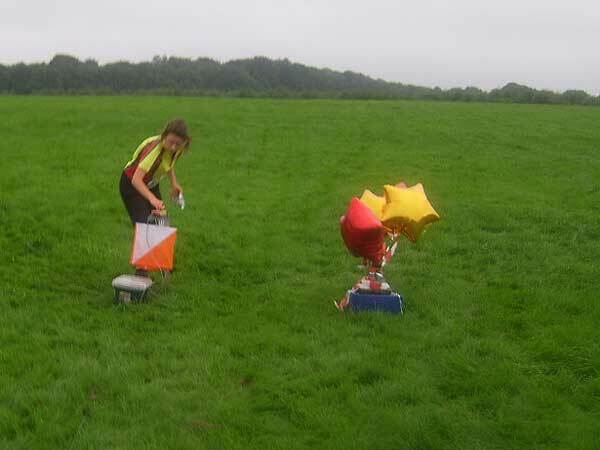 Rachel and Liz Britton clocked up 3 controls before Liz was swept 200 yards down a stream they were trying to cross, which resulted in Rachel summoning a helicopter rescue while others put up a tent on an island to look after Liz. Fortunately Liz was discharged from hospital on Sunday afternoon with nothing worse than a slight fracture of one wrist and a general battering. Clive and Jackie did 2 controls, 55 points, and were at 800 metres heading over Great Gable for their third when they decided enough was enough. They had a struggle getting down to Seathwaite, but managed it in time to get a push out of the car park before the approach road flooded, so they were home before the rest of us. Then we all spent Sunday gazing in wonder at what the media were putting out. Their lack of understanding of, or interest in, what a 2-day mountain marathon is about is, I'm afraid, no surprise. It makes you wonder whether the OMM should employ a PR company, and whether it would do any good if they did. More about the runners' experiences in the next action-packed edition of Deeside News. Activities include walks, running, O training, games in the evening and the CompassSport Cup heat on Sunday. Full details and booking form on page 13 of Deeside News, December 2008. 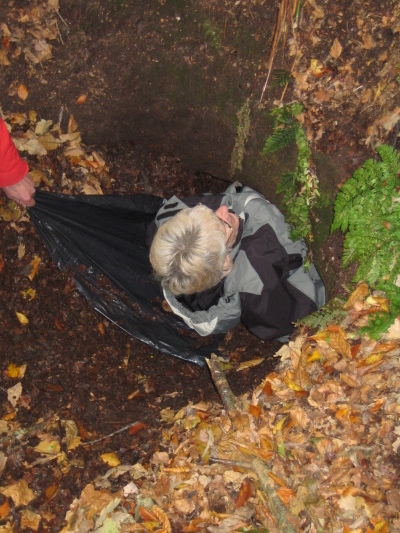 A reader, Mr Owens of Warrington, points out that this news item was wrongly headed "Bickerton Hill", which is south of the A534, whereas the walk was north of the A534. 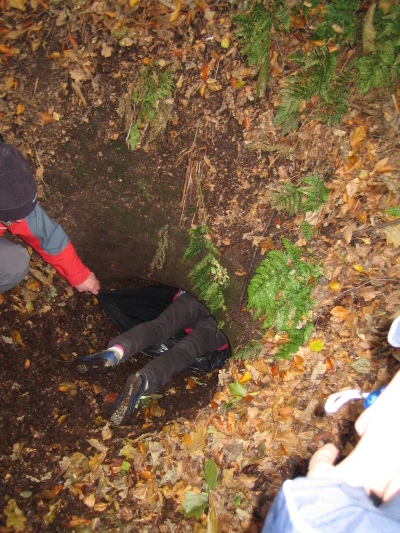 Since Mr Owens is planning two events on the real Bickerton Hill next month, we have to trust that he at least knows where the hill is; we have therefore changed the heading on this news item. Editorial apologies for the error. 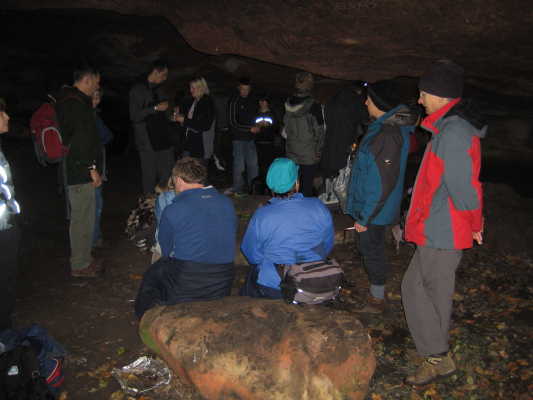 Team Smithard led a walk around the caves, coppermines and old railway tracks of Rawhead and Bulkeley Hill. 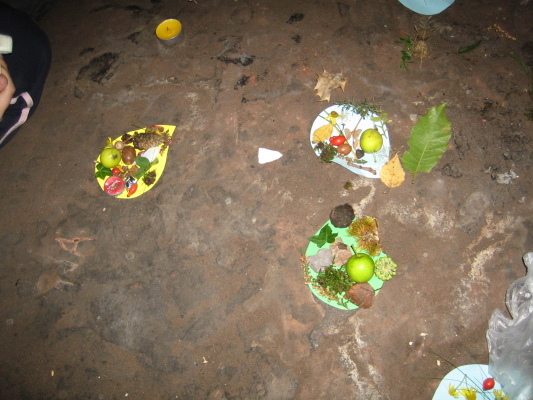 Lunch was marshmallows flambéed over candles in the Queen's Cave, with a competition for the younger juniors to see who could fit the most items on a cut-out of a leaf. A good time was had by all - thanks to Mike and Pauline for leading the day. Hint: click on any one of the above thumb nails to reveal the slideshow and then use the right-arrow key (or hover your mouse in rhs of photo) for the next picture, left-arrow key (or hover your mouse in lhs of photo) for the previous picture and Esc key (or click the close button) to stop the slideshow. There is an opportunity for a volunteer to coordinate the people side of this exciting event. Permission is now granted for both the lab and the woods, and John Kewley and Pete Owens will sort out all the technical and computing side of things. They promise that the event is not going to be as complicated from an organisational point of view as last time! David Beattie will be running a mapping course at Fox Howl on Saturday 29th November, from 10:30 until 15:30. This will concentrate on the surveying aspect, and not cover how to use OCAD. After an introductory talk on the principles and practice of surveying, there will be a surveying exercise in a part of Delamere. The results of this will be examined and discussed at the end of the afternoon session. 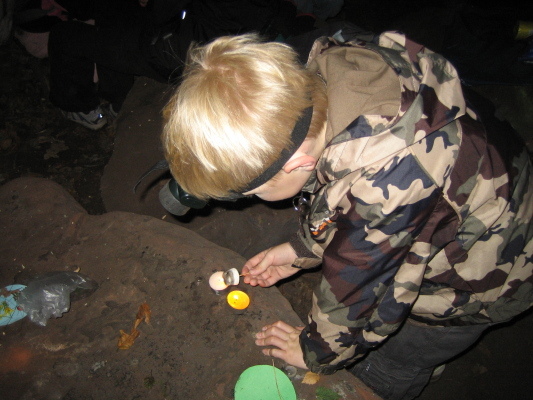 There will also be a distance learning exercise of a part of Primrose, which can be taken away and done later. Please let David know (tel 01829 751032) if you intend to go. You will need a packed lunch, an adequate number of 2H pencils and a proper rubber, and a clip board (or better still an A4 sheet of plastic or laminate). 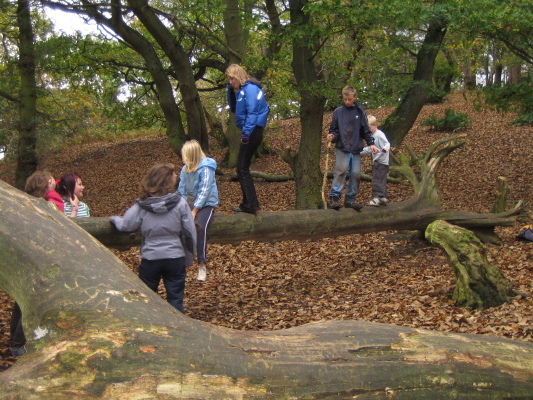 The District event which was to have been held at Thurstaston Country Park, Wirral on Sunday 26/10/08 is postponed. An announcement will be made when we have arranged a new date for this event. 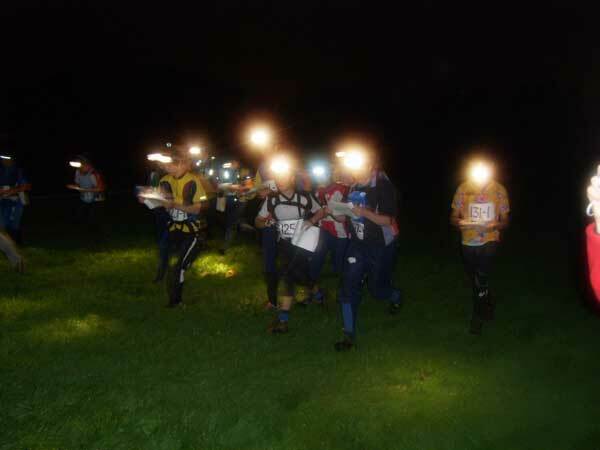 Another exciting 'on the edge' night/day relay for Deeside juniors last weekend as three 6-person DEE teams battled it out with other clubs and themselves. The top team were always in the hunt, leading after 3 legs but eventually finishing 5th behind winners MDOC. Our 2 handicap teams had their own battle eventually finishing about 10 minutes apart after three and a half hours' running. Thanks to the drivers and headlight lenders. Full results via AIRE website, report in next DEENEWS. 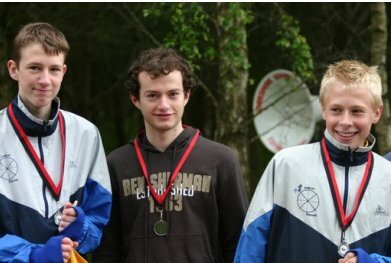 David Schorah has been selected for the GB Junior Team at the 7th European Youth Orienteering Championships in Switzerland from 9th - 12th October 2008. Chris Owens has been selected from among the North West Junior Squad to join the national Start Squad, which is for "athletes aged from 14-17 who are showing the talent and determination to progress into a world class athlete". Congratulations to David and Chris who have been offered places in the England team for the Senior Home Internationals in October in Scotland. This team is a combination of 21's and 20's running a relay and an individual race. I ran 5 times in Sweden followed quickly by 6 times in Wales this summer and survived unscathed but 3 days in Yorkshire was quite enough - I'm bruised and battered with a touch of trench foot. The night O was easy running I'm told but I gave that a miss. But such is the need for some Deesiders to win something, they return year after year to this (small) event with so many trophies (mugs) to be garnered. This year, Sian Calow won the VW class at the night event with Bob Elmes 2nd in SVM class. The individual days reaped nothing but long times for most but Pat Spoonley picked up 3rd place in W70. The Smithard family jettisoned Mike's brother Phil after several years mug collecting in the 120+ class, wisely, as it turned out, dropping down to the B class with Pauline to the parents and child class, a sneaky manoeuvre with junior Chris to do the majority of the work (its a mass start score event where you split the controls between you). It didn't turn out that way when I got the 2 steep climbs! So the grey mugs have joined the black, the yellow and the white ones in the cupboard. Phil meanwhile, got snapped up by Roy Lindsell of OD (but also a local member of DEE) and his M21 son for the 120+ class, and such was the nature of the A course, they finished 2nd despite finishing 15 minutes late! We thought about going home when we saw what camping space was still free on Saturday morning, but stayed, and were glad we did. I shall be making a contour map of the underside of our groundsheet available on Routegadget. The running was a bit physical [Surely some understatement? Ed.] but was enjoyed, especially by Callum Crocker (2nd in JM5M, only 4 seconds behind the winner), Michael Woods (2nd in M50S), and Pat Moody (3rd in W50S). Those with time to look at the full results can amuse themselves by working out that a spread of 2 minutes covered Phil Smithard, Callum, and Mike Smithard, who all ran course 4 though in different classes. Don't ask me how I came to be running the A team score relay course with Siân Calow and Pat: it took me half an hour to realise that I was never going to complete the 5 compulsory controls within the hour, our even within the hour and fifteen minutes at which you lost all your points, let alone punch any of the optional controls. Again, those sad souls who enjoy following such matters can read the EBOR Forum to see what excuses some of the other competitors came up with. 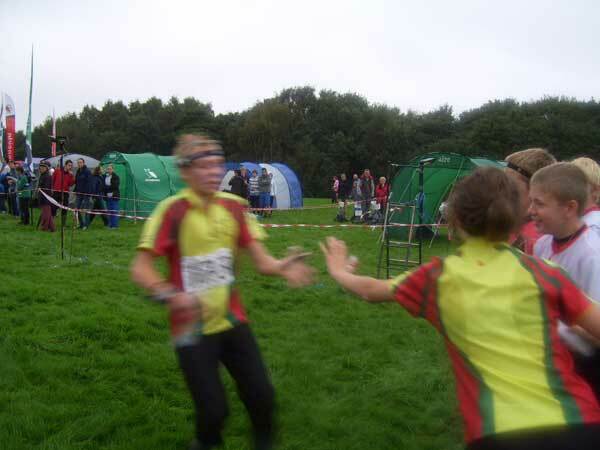 The junior relay team of Bea and Ed Calow plus Helen Elmes reported that they hugely enjoyed wading along marshy rides and through swollen streams. That's the spirit! DEE Fixtures Secretary Barry Barnes cycled from Land's End to John o'Groats. Full details and daily reports. Both the above posts must be filled at the club AGM in October. Nominations are requested as soon as possible - please contact John Padget (secretary@deeside-orienteering-club.org.uk). Currently Jill Barnes. Jenny Palmer has offered to take on this role, and has been shadowing Jill this year. Currently Chris Smithard, but does not have to be undertaken by a Junior, nor be a Committee post. If you are interested in one of these, or indeed in any committee post, you can discuss your interest with any committee member. Matthew Vokes and Tom Beasant have been rewarded for their performances at the JK and British with selection for England for the Junior Home Internationals at Ainsdale, 20/21st September. Congratulations to them and good luck in the dunes. 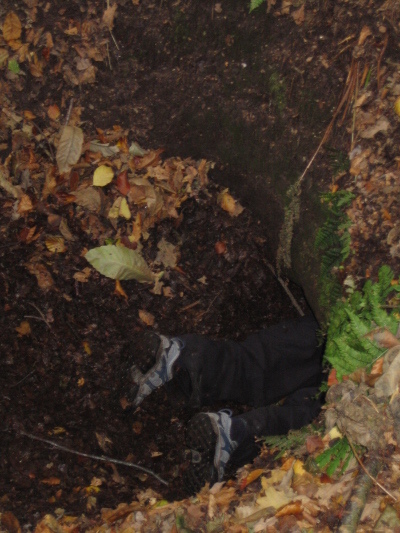 Chris Owens is believed to be a reserve in the M14 class. Nick Campbell (and Jane?) is/are Controller for the event working with Graham Nilson of MEROC as mapper/planner? As it's a closed event, there are normally no details of it on the BOF website, sometimes not even where it is! and no results one year for about a week afterwards! At least the map reference is on the fixture list this year so you can go and spectate if you're so inclined. It's at least partly a new area so no doubt we will get to run there sometime shortly. The sun shone, the runners ran, the walkers walked, the children ran around in the field, the barbeques glowed (and smoked and flared), and everyone had a really good time. The living fossils (Wollemia nobilis) were much admired. The rules of Bing-O involved running a course with controls marked, but no control codes on the map; punching a bingo-style control card in the appointed place when you got to a control (unless, of course, it was a cunningly deployed dummy control); and returning to base once you had completed a line of controls on your card. There were bonuses for getting more than just one line - not very big bonuses, so (with hindsight) lots of competitors could have scored better had they returned to base with one line, rather than carrying on and filling their entire card. Oh if only I'd listened to what Mike Smithard said (again). or blow your mind with the detailed results. Well done MDOC for winning, and thanks for putting on a super competition, food and social - with special thanks to Roy and Rosemary Hayes for staging the event at their farm. 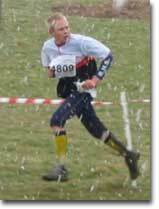 DEE member David Schorah, currently studying Sports Engineering (or is it Orienteering!) 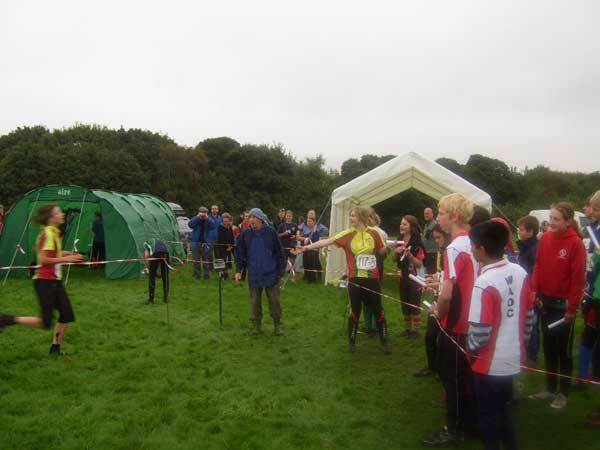 in Sheffield, was second in the Garmin Ultrasprint a "very high intensity sprint orienteering race" in Millhouses Park, Sheffield on Saturday 12th July. You can now input your route, compare it with other competitors' routes, and race against them in a simulated mass start using RouteGadget. Or you can turn off "Mass Start", and see just who it was you were following round in circles. 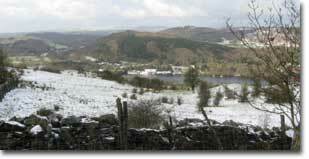 Follow the link above, select the Halkyn event, and away you go. Use the TOP right-hand panel to select course and name then enter your route. Use the BOTTOM right-hand panel to select and view existing courses. Make sure you have successfully visited each control - the thick purple circle then changes to a thin red circle - before moving on to the next control. Good idea in real life, too. 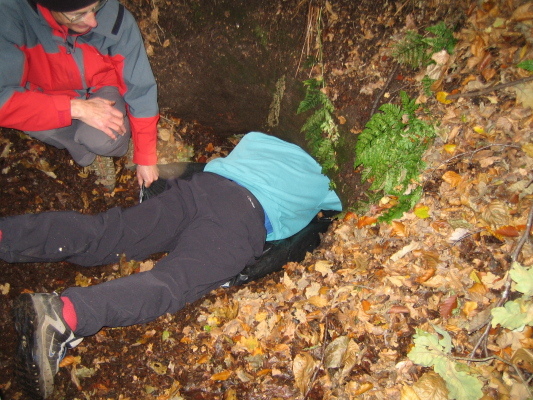 Don't forget the MDOC/DEE Challenge and Social is this coming Sunday (13th) at Roy and Rosemary Hayes home - Wyches Farm, Soss Moss, Nether Alderley (off the A535 between Alderley Edge and Chelford). Chairs and rugs (and umbrellas?) are advised. If you haven't already done so, please can you let Julie Brook (MDOC) know as soon as possible if you will be coming by leaving a message on 01663 745020. Victory in the "Carrock Fell" class for Chris Wilcox and Nigel Beasant, first out of 122 teams; 24th out of 76 in the "Wansfell" class for Darren Baker and Elaine Sutton. Just getting round looks to have been pretty challenging - lots of mps, and plenty of dns on day 2. See the Saunders Lakeland MM web site for full results, splits, photos etc. We await a fuller report from the participants. After a couple of leaner years, the Northwest Junior Squad returned to winning ways in the Northeast recently when beating Scotland into 2nd place in the annual Junior Inter-Regional Championships. Deeside boys made a massive contribution to this by finishing 2nd M14 (Chris Owens), 2nd M16 (Matthew Vokes), 7th M16 (Michael Beasant) and 4th M18 (Tom Beasant) in the Saturday individual with Chris, Matthew and Tom forming the top NW team in the relays on Sunday with Tom being beaten by 2 seconds into 2nd place by Alasdair McLeod of the Scottish team in a dramatic finish after leading almost all the way round the 3rd leg. Well done to all 4 for a great performance. Zoe Smithard was selected but had to pull out of the team at the last minute due to injury. Charlotte Watson, a first year W16 of WCOC, fulfilled the confidence of the selectors, by running up a class and winning the W18 individual by 2 minutes and then, setting off with 5 W18's on the last leg of the girl's relay, ran away from them all to win for the NW again by over 2 minutes. 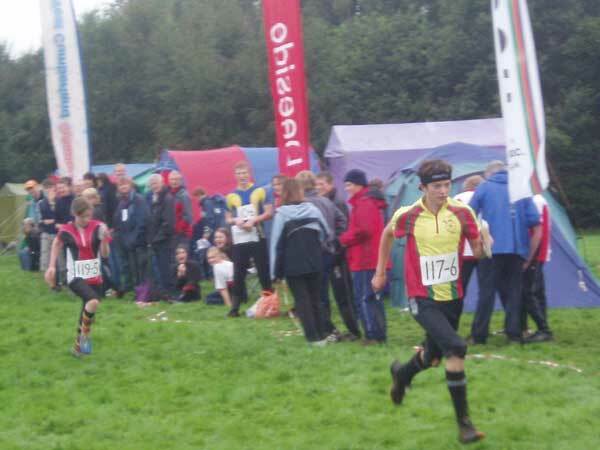 More great pictures of the event, including ones of Tom being beaten on the run in of the relay, Matthew at the last control(?) of the relays, Tom getting the trophy and maybe others in Robert Lines's Public Gallery. 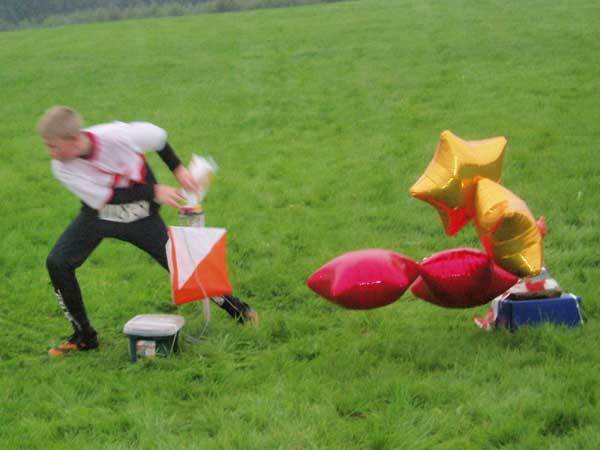 As the climax of Walton Chasers' Chase Challenge Weekend there was a Long-O competition on Sunday morning. "Legs longer than usual, with more route choices and less navigation within the control circle." In the 21km A course, won by Rhys Findlay-Robinson, Clive Giddis came a commendable 4th. Chris Smithard's long legs carried him to success in the 16km race, with father Mike in 4th place. The longest leg on this course was a straight line distance of 4km, and some managed to make it even longer. The first 9 controls were straightforward (apart from the distance) then, just as you thought it was only for runners, they threw in the technical bit. Overall, a good way to get to grips with the topology of the Chase. 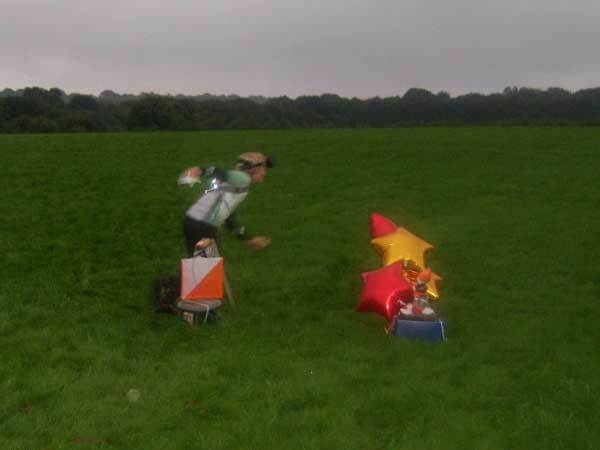 Anyone fancy a go at the Mountain Bike Orienteering event next time they do it? Fewer Deesiders than normal (due to exams?) on this variable, in places testing, area. A warm day, the area tracking up so some easy 'path' running for later starters including me through the long grass areas and on the 'moor'. Mal Irvine, off early, didn't need the help as he strolled to victory in M50S (bodily wear and tear means he limits his runs) finishing well clear of Mike Woods in 3rd. Andy Hemsted kindly lost several minutes on one control whilst Axel Blomquist went walkabout more than once, so I repeated my success of the JK here in 2005. Good to see Kate running the long course again. See the full results for this event. 5 juniors have been selected to run for the North West in this year's junior inter-regionals in June - Chris Owens, Mike Beasant, Matthew Vokes, Tom Beasant and Zoe Smithard. Congratulations to them and good luck for the weekend. 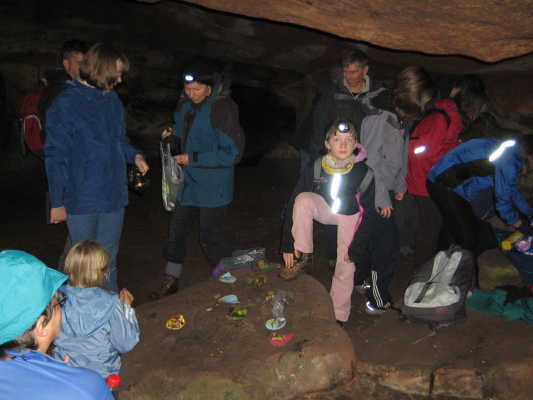 The Clwydian Range Runners invite you to join in "The Midsummer Meander" Children's Fell Runs at Cadole. 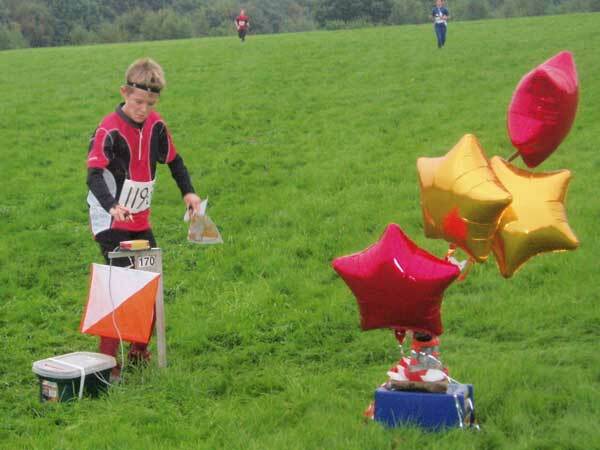 The event is for all children aged 6-13 years with courses from under 0.5 miles up to 1.8 miles. The event is to be held on Sunday 22nd June with Registration from 11:00am with the start at 11:30am at Cadole (by the Colomendy Arms). Get there using a 10X bus from Chester Railway Station 10:10, 16:45 return - so why not make a day of it. Joy and gutted are no doubt the two emotions felt by Deeside juniors this week as Chris Owens, Michael Beasant and Matthew Vokes get selected for the summer junior training camps in Scotland and Sweden whilst Dave Schorah misses out again for the Junior World Championships by one place and is first reserve. Whether it was the one second last year or a bit more in this year's FCC final, his efforts to overcome injury and the training to get back into form have been in vain. Commiserations to Dave and best wishes to the three others - that's seven years in a row now for a Deeside junior to get to the second year M/W14 training camp. 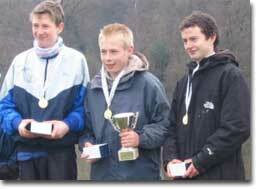 The 18's and 20's ran the final 2 races of the Cup series last week-end in Yorkshire. With both final placings and selection for the Junior World Championships at stake, it was a tense week-end. The middle race had a lot of controls, many in green areas requiring the ability to run at speed bent double. This generated a lot of sore backs on Sunday which maybe needs some feedback to planners. Most slipped up in the low visibility so slight depression all round. The long courses on Sun day enabled the very fit to triumph. When all the times and points were added up in various ways, Chris Smithard (5th & 6th) and David Schorah (3rd & 4th) finished 4th and 5th in the overall M20 series standings with Tom Beasant 6th in M18 and Rachel Findlay-Robinson 11th in W20. Well done to them. On the week-end, not so good - even Dave had hoped for better - with David, Chris, Tom and Rachel finishing 5th, 12th, 17th and 19th in the combined 20 &18 rankings. With 6 to go to the Worlds, David is in with a chance of, we think and hope, the 5th or 6th spot, so let's wish him luck in the selection process after his desperately close miss out last year. Announcement of the team is next Wednesday 14th. In the 'best club' award (best 4 to count), DEE finished 2nd behind Sarum, one place better than the last 2 years. 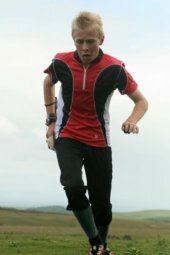 DEE have been offered the opportunity to plan and organise one day of the Lakes 5-day Event in 2010, on Pike O'Blisco or Yewdale. We have identified an Organiser and a senior courses Planner. We still need a Planner for the junior courses. We went, we saw (the snow and some went up a hill and played in it) and some succeeded but most got confused and ran round in circles for a while. The dunes of Culbin, especially those in the green, tested the nerves and contour interpretation. Well done to those who did well: Matthew Vokes 2nd in M16, his top result of the year so far, Chris Smithard and David Schorah, 4th and 5th in M20E, Mike Smithard 5th in M55, Tom Beasant 5th in M18 and Chris Owens 8th in M14. The relays were to test if our M18's could win for a third time, the commentary was somewhat lacking so we thought we were in the lead after 2 legs but then Nottingham came in to win, with Matthew, Mike and Tom about 3 minutes down. Hard luck to them but a good result. Meanwhile to give all hope for the future in our eternal quest for the perfect run, Mike Smithard seemed to have one in the M50 class recording the fastest split of the day against some ex-WOC runners (a good few years younger than him). 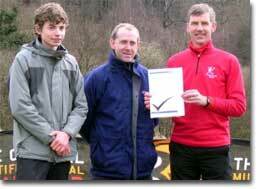 DEE collected their Clubmark accreditation at JK 2008. DEE's Lead Coach, Noel Schorah, received the formal Clubmark certificate at a snowy JK Relay prizegiving. Clubmark is the Sport England mark of high quality junior clubs and the Committee would like to thank all those involved in helping achieve this recognition. A Clubmark sub-group was formed comprising Pete Sleigh, John Padget, Chris Smithard, Noel Schorah and Mike Vokes. Any of these will be more than willing to discuss the elements of the programme, and there is also a DEE Clubmark folder for those who would like to view it. We will be working hard to maintain the standard of club practices and coaching, particularly for our successful junior members. Tom Beasant - JK Champion! Having settled his nerves at the sprint race on the Friday, Tom tore round the middle distance race at Leith Hill on Saturday, finishing clear M18 winner on the day. The 12k Sunday race was closer but Tom's lead was not overcome so many congratulations to Tom on his triumph in a very competitive class - and for finishing 7th overall in the combined M20 and M18 listings. Tom then followed that with another great run in the relays to bring DEE home winners of the M48- class with Matthew Vokes and Chris Owens setting Tom up for the glory leg. 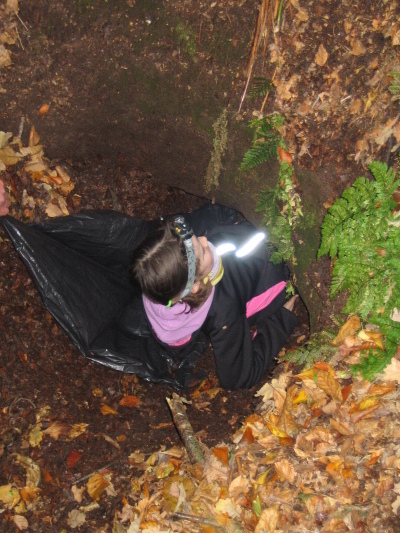 Several Owens and Elmes family members competed in one day each of the exceptionally challenging Trail O competition. Selecting the correct control at this sport is fiendishly difficult at the best of times; doing it whilst standing still in a blizzard is near impossible. Whilst not highly placed overall, Pete Owens was the leading competitor from our club, and is therefore DEEJK08TO winner. On the social side, a large team of Hughes, Elmes, Smithards and Calows triumphed in the Saturday night quiz, and won lots of chocolate Easter eggs. 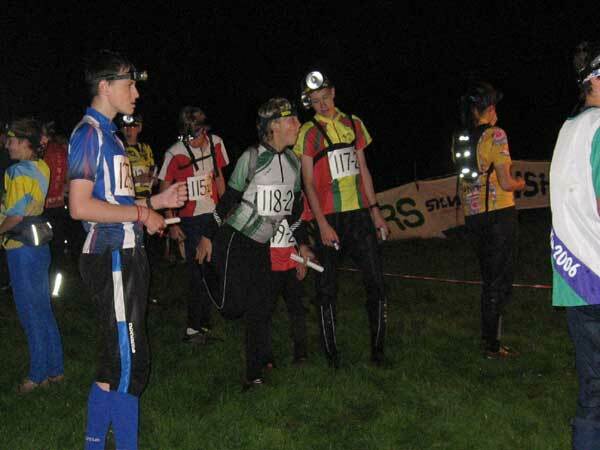 Editor's note: Many thanks to Mike Smithard for his report, and for organising the relay teams. Full results on the JK2008 website. 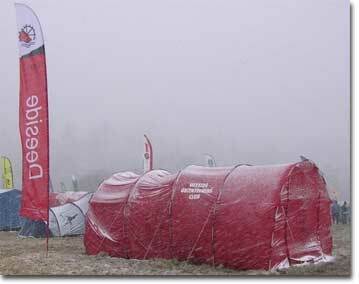 Finally for all you intrepid adventurers at JK 2008, here is a memory that'll keep you warm and cosy at night! 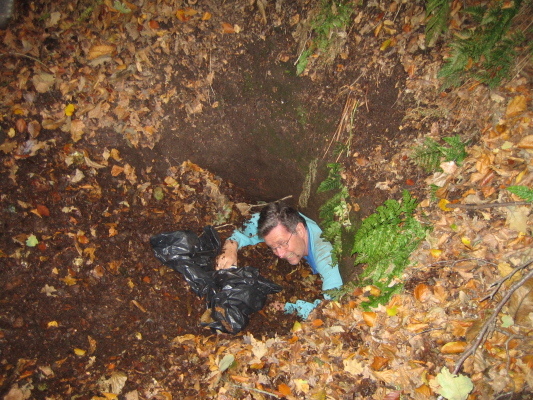 Mike Smithard reports on various happenings on 17th February 2008. Somewhere in the far north east. 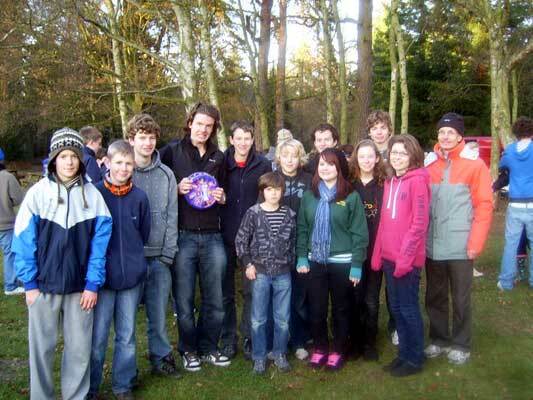 So soon after the 2007 version, Deeside sent a select team of 1 plus 1 driver to the Northern Championships. A well chosen representative, Chris Owens won the M14 trophy by a comfortable 13 seconds with the next 2 within 2 minutes of him. Congratulations to Chris on retaining the trophy! Also to Pete for a mid class finish on M45. Meanwhile, in another part of the forest, many went to Cannock Chase where the temperature was just above freezing but with no wind but with hat and gloves, it was very pleasant. More so for the M55, M60, JW5L, JM5M, ... classes who had the pleasure of a 1km uphill, straight, track run from control 4 to 5 - though I hear the white forest it went through wasn't so white inside. The pit at the end of this leg was not so far from 'a pit' I never did find in the 1968 British Champs (sponsored by Guinness - which was free at the finish but not quite what you needed) when I was young and hairy and 'navigating' on an OS 1:25,000 map with lots of tree symbols, contours and rides but nothing else. Editor's note: Modesty prevents Mike from pointing out that he won the M55L class at Cannock in a scorching 43:02. Steve Ingleby came a creditable 4th. Full results on the Walton Chasers website. 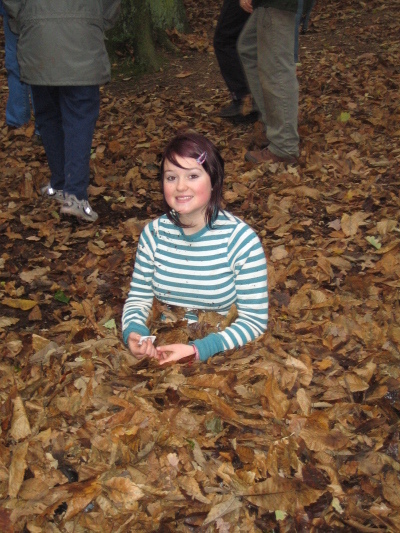 DEE's Winter Weekend at Lakeside - the largest outdoor activity centre in Europe - drew around 50 participants of all ages. On Saturday afternoon there was training planned by Pete Owens, who cunningly used one set of controls for at least three different exercises. The corridor/window exercise was particularly popular. 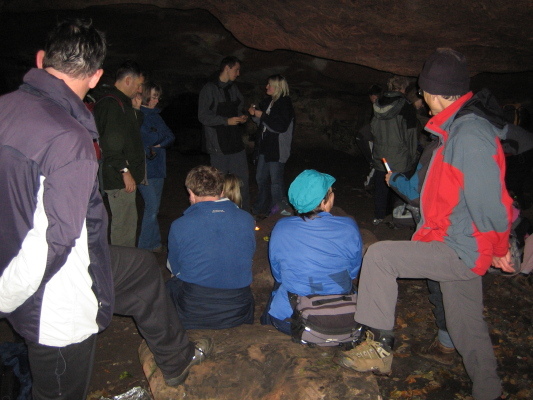 As soon as it went dark, it was over to Jon Hateley's night event within the grounds of Lakeside. Some went round jolly quickly, but the real kudos goes to the winners of the coveted DEE Discharged Duracell trophy for the longest time out on the course (Bob Elmes, his first individual trophy in five years' orienteering) and the trophy for the dimmest light (Liz Jackson - it didn't seem to slow her down). 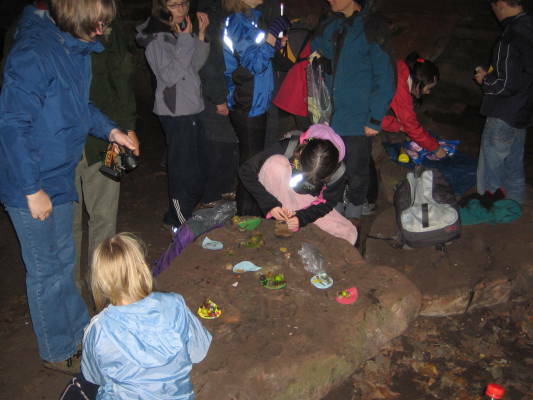 Evening games were led by Pauline Smithard, who kept us all active and amused with Orienteetle (like Beetle, but you build an orienteer), photo recognition, and many more. On Sunday we were off to the Bouth Regional event, then home. Many thanks to Mike Smithard for organising the weekend, and to Pete Owens, Jon Hateley and Pauline Smithard for their events. Congratulations to our terrific juniors, and to all those involved in their training. The award was presented to the Club on 21st January 2008. 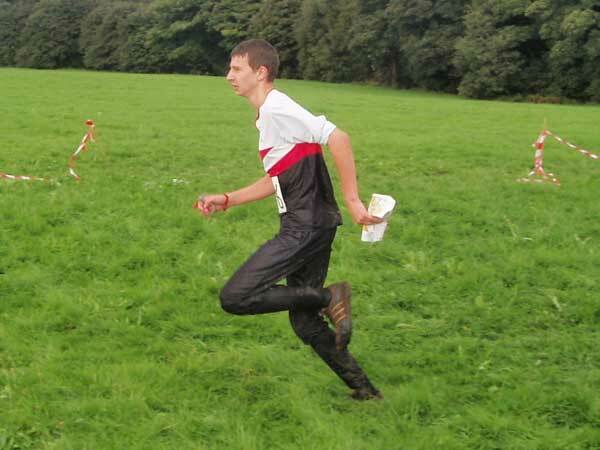 Congratulations to Tom Beasant, who has been selected to run for England at the Interland international - often used to give those not in an England squad a chance to run internationally - on 2nd March in Holland against the hosts, Belgium (French), Belgium (Flemish) and NW Germany teams. Brother Mike ran in this event last year. Tom has been selected to run as an 'M20' (the rules allow 2 M20's and 1 M18). 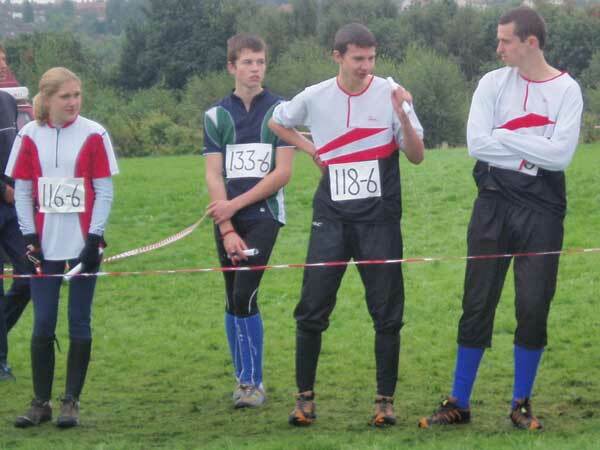 Chester City Sprint-O Races in 2009? Not off the drawing board yet but looking positive, with a good reception to the idea from Chester City officials and strong interest from club members in planning etc. Hope is for a low key club-only trial event in 2008 and a more major event in 2009. Watch this space! Looking for 2009 news? Go to the 2009 News page.